Pasanjeok is one of the dishes that Koreans make usually on festival days. 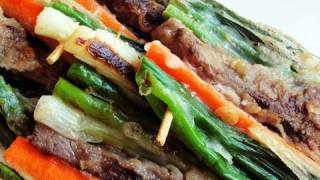 Pan-fried skewered pancake with green onion, carrot, and beef! It already sounds colorful, nutritious, and delicious, doesn’t it? Pasanjeok remains a happy memory of my childhood. My mother, a school teacher, used to teach and live on an island where our family lived. My father was a businessman in a city on the mainland. When my father sometime came to see us, we had been in festive mood for days before he came. He usually came with some presents for us. I added asparagus to the ingredients in the recipe because I found it gives a crunchy texture so that all these colorful ingredients are well incorporated. Each ingredient is slightly dipped in a light flour batter and cooked. You will enjoy 4-5 different textures and flavors at the same time when you eat it. Beef (sirloin steak), soy sauce, honey, garlic, sesame oil, ground black pepper, green onions, carrots, asparagus, salt, flour, and vegetable oil. Tenderize by pounding the beef strips against the grain with the back of the blade of your kitchen knife.. Put the beef into a bowl and add 1 clove of minced garlic, 1 ts honey, ½ tbs soy sauce, 1ts sesame oil, and ¼ ts ground black pepper. Mix it with a spoon well and refrigerate it. Cut 1 large carrot into several strips 4½ inches long, ½ inch wide, and ½ inch thick. Cut 6-7 stalks of asparagus (top leafy part) into 4½ inch long pieces. Cut 6-7 stalks of green onions into 4½ inch long pieces. Boil 4 cups of water in a pot. Add 1 ts salt to the boiling water and blanch carrot strips, asparagus, and white part of green onions for 1 minute with the lid closed. *tip: don’t blanch the green part of the green onions! 1 minute later, strain the vegetables, rinse in cold water, and drain. Put green onions, carrot, asparagus, beef strips on the skewers. Make batter by mixing ½ cup flour, ½ cup water, and ½ ts salt in a bowl. Drizzle some vegetable oil on a heated non-stick pan. Dip each skewer into the batter and put it on the pan to cook. About 1 minute later, turn over the skewers when the bottom part is light golden brown and cook for another minute. Cooking time should only be a few minutes because all hard ingredients are pre-cooked. When the beef strips are cooked, the pancake is done. Make dipping sauce by mixing 1 tbs soy sauce, 1 tbs vinegar, and ½ tbs chopped green onions. Serve it as appetizers or a side dish. Posted on Wednesday, May 5th, 2010 at 3:35 pm. Last updated on October 5, 2014. Posted June 9th, 2014 at 12:22 am | Log in to reply. Hi Maangchi! I always loved your recipes and your blog is always first one i go to whenever i want to cook any korean food. I was talking to a coworker who recently came back from a long trip from Korea and told me about how delicious the Sanjeok he had was. But from the way he described, it was more like a beef patty made with ground beef. I was wondering if there are variations and such to that and whether or not you have a recipe for it. Or maybe I heard wrong and it’s not sanjeok but perhaps something else? Posted May 7th, 2011 at 6:25 am | Log in to reply. Posted May 10th, 2011 at 12:33 am | Log in to reply. You made yummy pasanjeok! delicious! Posted February 22nd, 2011 at 10:06 pm | Log in to reply. This is incredibly delicious – I just finished making them and had a sneaky taste before dinner – it takes me right back to Korea though I don’t even recall having it when I was on holiday there! Wonderful recipe – thanks Maangchi. This recipe was originally posted on May 5, 2010 at 3:35 pm by Maangchi. It was last updated on October 5, 2014. The video was watched 133,697 times on YouTube & has 1,151 likes!